This is that perfect “Must-Have” stylist tool belt apron. Made of High Performance, Bleach, stain and water Resistant, heavyweight canvas-like fabric. This is a high quality, substantial tool belt. Unique design that organizes your tools. The “Wrap It Up” apron design securely Velcro wraps and slims your waistline. 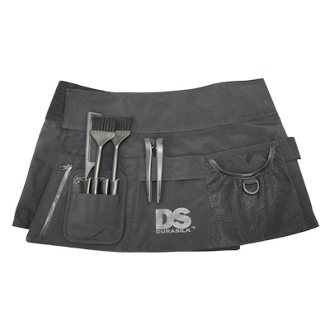 Features organizing tool pocket and slots, brush loops, tear-away tool pod and stretchy mesh clip/pin pocket. Hidden side zip, mobile phone pocket, keeps phone close so you can feel on silent vibe. Half style design doesn’t hide your style. Wear at waist or sling low for a modern look. This hairdresser tool belt is a stylist/colorist dream. Wrap adjustable one size design will fit ladies sizes XS-XXL (size 2-16). Tools not included.